V.F. Corporation (NYSE:VFC) was in 27 hedge funds’ portfolios at the end of December. VFC investors should be aware of a decrease in hedge fund sentiment in recent months. There were 32 hedge funds in our database with VFC holdings at the end of the previous quarter. Our calculations also showed that VFC isn’t among the 30 most popular stocks among hedge funds. Let’s view the key hedge fund action regarding V.F. Corporation (NYSE:VFC). How have hedgies been trading V.F. Corporation (NYSE:VFC)? At Q4’s end, a total of 27 of the hedge funds tracked by Insider Monkey were bullish on this stock, a change of -16% from the previous quarter. 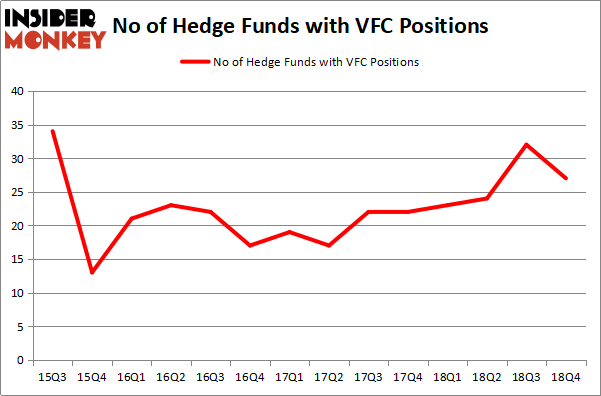 The graph below displays the number of hedge funds with bullish position in VFC over the last 14 quarters. With hedge funds’ sentiment swirling, there exists a few noteworthy hedge fund managers who were increasing their holdings meaningfully (or already accumulated large positions). Among these funds, Two Sigma Advisors held the most valuable stake in V.F. Corporation (NYSE:VFC), which was worth $197.3 million at the end of the third quarter. On the second spot was Arrowstreet Capital which amassed $159.6 million worth of shares. Moreover, Diamond Hill Capital, Citadel Investment Group, and AQR Capital Management were also bullish on V.F. Corporation (NYSE:VFC), allocating a large percentage of their portfolios to this stock. Seeing as V.F. Corporation (NYSE:VFC) has experienced bearish sentiment from the smart money, we can see that there were a few hedge funds who were dropping their full holdings by the end of the third quarter. It’s worth mentioning that Jeffrey Talpins’s Element Capital Management cut the largest stake of all the hedgies monitored by Insider Monkey, totaling close to $9.3 million in stock. Joel Greenblatt’s fund, Gotham Asset Management, also dumped its stock, about $7.5 million worth. These moves are interesting, as aggregate hedge fund interest was cut by 5 funds by the end of the third quarter. Let’s now review hedge fund activity in other stocks – not necessarily in the same industry as V.F. Corporation (NYSE:VFC) but similarly valued. We will take a look at Autodesk, Inc. (NASDAQ:ADSK), Manulife Financial Corporation (NYSE:MFC), Chunghwa Telecom Co., Ltd (NYSE:CHT), and Credit Suisse Group AG (NYSE:CS). This group of stocks’ market valuations are closest to VFC’s market valuation. As you can see these stocks had an average of 23.75 hedge funds with bullish positions and the average amount invested in these stocks was $909 million. That figure was $772 million in VFC’s case. Autodesk, Inc. (NASDAQ:ADSK) is the most popular stock in this table. On the other hand Chunghwa Telecom Co., Ltd (NYSE:CHT) is the least popular one with only 2 bullish hedge fund positions. V.F. Corporation (NYSE:VFC) is not the most popular stock in this group but hedge fund interest is still above average. This is a slightly positive signal but we’d rather spend our time researching stocks that hedge funds are piling on. Our calculations showed that top 15 most popular stocks among hedge funds returned 19.7% through March 15th and outperformed the S&P 500 ETF (SPY) by 6.6 percentage points. Hedge funds were also right about betting on VFC, though not to the same extent, as the stock returned 19.6% and outperformed the market as well. Here is What Hedge Funds Think About AutoZone Inc. (AZO) Were Hedge Funds Right About Flocking Into Sempra Energy (SRE)? 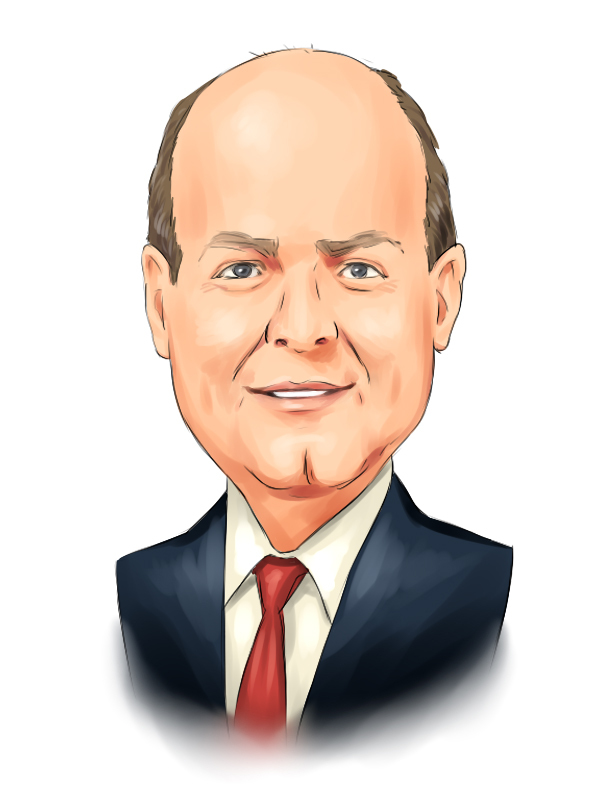 Is IQVIA Holdings, Inc. (IQV) A Good Stock To Buy? Here is What Hedge Funds Think About BT Group plc (BT) Hedge Funds Dropped The Ball On Fortive Corporation (FTV) Were Hedge Funds Right About Souring On Canon Inc. (NYSE:CAJ)?